The Camden CM-420R is a single gang mushroom button. 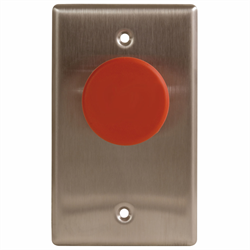 This model comes with a resistant free-spinning heavy-duty plain red button as well as a vandal resistant stainless steel faceplate. This is a normal open and normal close variant.